A record of volcanism preserved along ancient mid-ocean ridges provides evidence for heightened worldwide magmatic activity 66 million years ago just after the Chicxulub meteor struck Earth, according to University of Oregon scientists. The research, published in Science Advances, points to changes in the strength of gravity above the seafloor, which indicate a transient period of increased volumes of magma being released along ridges that mark the oceanic boundaries of tectonic plates. Lead author Joseph Byrnes, a former UO doctoral student, says that this global volcanic activity was likely triggered by strong seismic waves radiated from the meteorite impact site. Subsequently accelerated volcanism, he said, likely would have been active during the mass extinction of the world's non-avian dinosaurs. Volcanism, particularly a massive outpouring of basalt recorded by the Deccan Traps in India, has been in and out of the extinction debate. Rare volcanic events at such a scale are known to cause catastrophic disturbances to Earth's climate and, when they occur, they are often linked to mass extinctions. Since evidence of the meteor strike near present day Mexico surfaced in the 1980s, scientists have debated whether the impact or the Deccan Traps volcanic eruptions was the primary driver for extinction of the dinosaurs. Progressively more accurate dating methods indicate that while the Deccan Traps eruptions were active during the mass extinction, they actually began significantly before the Chicxulub impact, said Leif Karlstrom, a professor in the UO's Department of Earth Sciences and co-author on the study with Byrnes. The meteor is closely aligned in time with the onset of mass extinction, seeming to indicate a dominant role, he said. Still, the near coincidence in time of such globally catastrophic events continues to spur debate. In 2015, researchers at the University of California, Berkeley, proposed that the two events might be connected. They suggested that Chixculub may have modulated distant volcanism by sending seismic waves through the Earth and accelerating volcanic activity in the Deccan Traps. Similar to the impacts that normal tectonic earthquakes sometimes have on wells and streams, Karlstrom said, the study proposed that powerful shaking liberated magma stored in the mantle beneath the Deccan Traps and caused the largest eruptions there. The new National Science Foundation-supported study at the UO adds another layer to the story, said Karlstrom, who also co-authored on the UC-Berkeley research. It suggests that other volcanic activity around the world was triggered by the meteor. Seismic waves moving through the Earth, he said, may have accelerated volcanism already occurring along mid-ocean ridges. The findings emerged as Byrnes, now a postdoctoral researcher at the University of Minnesota, discovered the evidence for volcanic activity by analyzing publicly available global datasets, including two updated in the last decade, on free-air gravity, ocean floor topography and tectonic spreading rates. In his analyses, Byrnes divided the seafloor into one-million-year old groupings, constructing a record back to 100 million years ago. At about 66 million years, he found evidence for a "short-lived pulse of marine magmatism" along ancient ocean ridges. This pulse is suggested by a spike in the rate of the occurrence of free-air gravity anomalies seen in the dataset. Free-air gravity anomalies, measured in milligals, account for variations in gravitational acceleration, found from satellite measurements of additional seawater collecting where the Earth's gravity is stronger. Excess matter on the ocean floor, such as new magma, is a primary cause of elevated marine gravity anomalies. A gal reflects a change in the rate of motion of a centimeter, about 0.4 of an inch, per second squared. 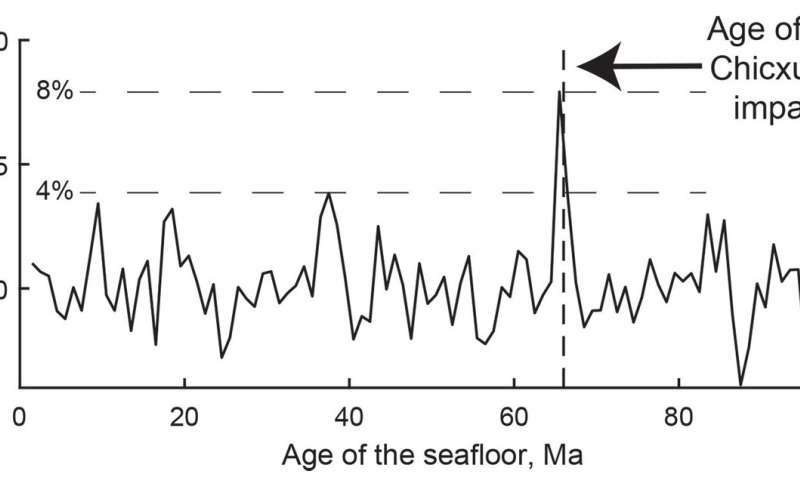 Byrnes and Karlstrom found changes in free-air gravity anomalies of between five and 20 milligals associated with seafloor created in the first million years after the meteor. "We found evidence for a previously unknown period of globally heighted volcanic activity during the mass-extinction event," Byrnes said. 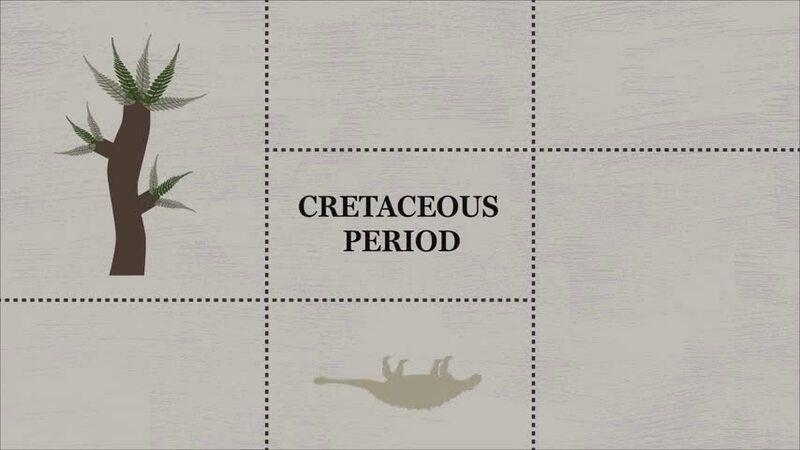 "This study does not say precisely that this volcanic activity is what killed the dinosaurs. What we are adding to the conversation is global volcanic activity during the known environmental crisis." 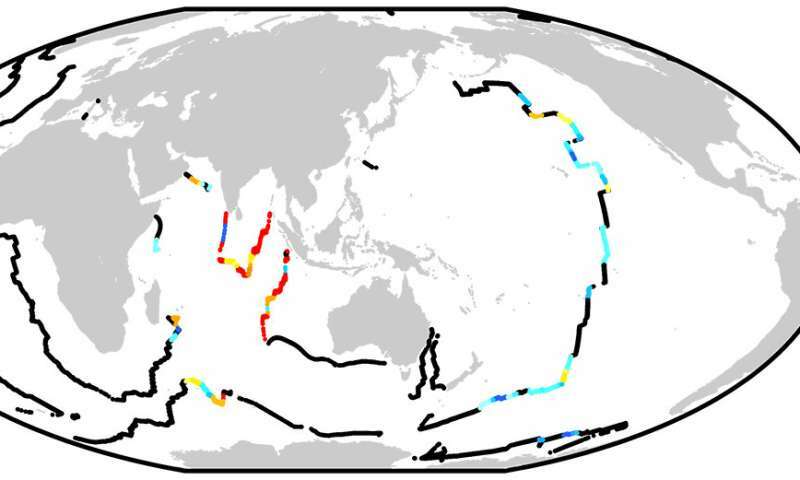 The gravity data analyzed in the research came from the Scripps Institution of Oceanography at the University of California, San Diego, the seafloor ages from the EarthByte group at the University of Sydney, and seafloor elevation from the National Geophysical Data Center of the National Oceanic and Atmospheric Administration. The Chicxulub meteor was believed to be six miles in diameter and traveling at 20.000mph. It had to shatter Earth's crust and cause a massive pressure impulse through the earth's core! To see a spike in volcanism corresponding to that event would demonstrate just how powerful and significant that event was. And to think that within 100 years, the planet will be impacted with an extinction event caused by CO2 levels from fossil fuel combustion and people have the capability to do something about it now, but are so brain washed by FOX news and the climate denier goony squads, that they don't act to prevent the coming global scale extinction event. It's only 2018. By 2100 we are all going to be toast.